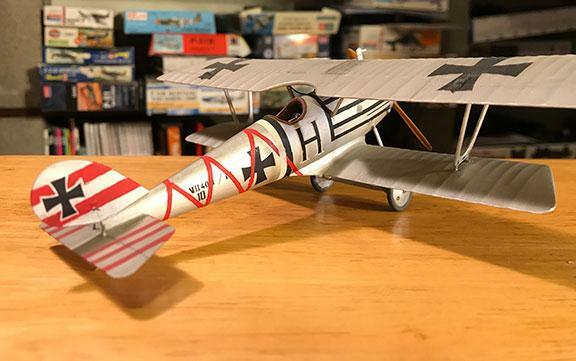 1/48 Eduard Pfalz D-III with decals from the Glencoe kit. While building this one, the control stick broke at least three or four times. The decals shattered and I had to buy another kit to get a complete set (though if you look, you will see some paint to fix some problem areas) Recently, I decided to clean it up and it fell on the ground. 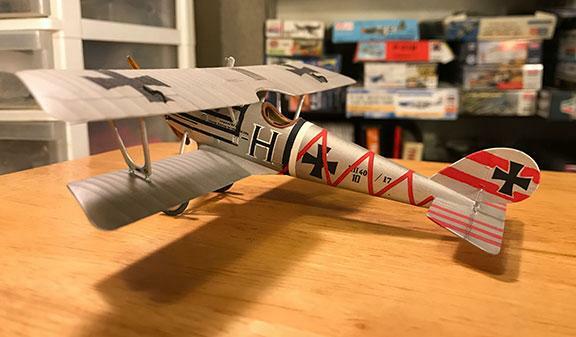 I had to fix the wings and landing gear, so you may see globs of super glue at the joins. Thank goodness I didn’t rig it before all that, it might have ended up in the garbage bin! Still, after all that, I’m happy at how it ended up. “…he shoots…he scores…no, wait – he SAVES…” – (turned out pretty good despite everything). I sometimes feel I’m “all thumbs” when I get so far along, and then drop or break something! Just last night it happened again – drilling through a set of dive brakes for a Pe-2 and broke one! All in the quest to build the perfect model Brian. Been there, done that, got the T-shirt. In spite of your troubles it looks good from where I sit. Thanks for sharing. Brian, you saved it! Well done!! It turned out well in the end, I’m sure that if you hadn’t told us about the mishaps we’d never have noticed. Brian, nice Pfalz. I’ve liked that airplane since The Blue Max. Shame about the decals, but you knew where to go for replacement. Best thing about the Glencoe reissues are the decals, and removing the embossed markings. 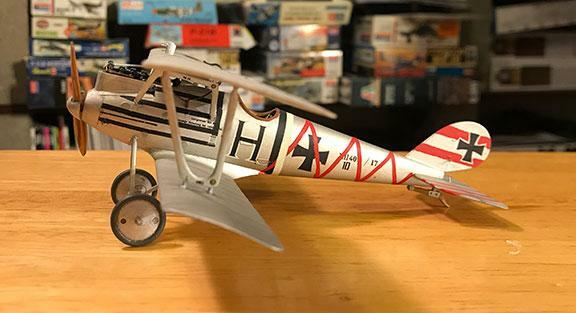 Really a good job on this bi-plane. Its looks so real. 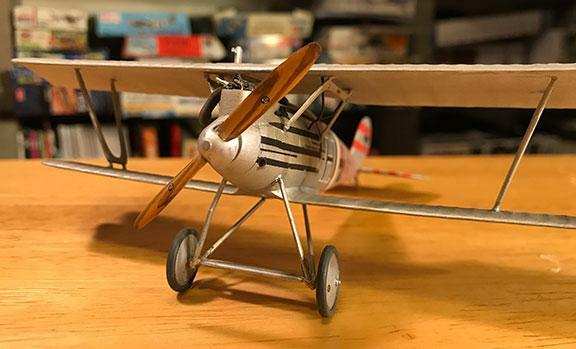 I just love the Eduard Bi-planes although I have only built one so far.